Nothing satisfies the stomach and the soul like a meat pie on a cold night. I've made lots of chicken pies and a version of a meat pie using biscuits on top rather than crust. This recipe looks like a must try. sounds very similar to a stew i made this week but with mushrooms instead of onions. very warm and hearty. Oooo, I love meat pies. That looks and sounds delicious. Oh, I can't wait to try this. We had a cold snap earlier this week which is gradually easing out into a cool and rainy weekend. This will be perfect for tomorrow's dinner. Somehow, although this pie seems quintessentially English, I can also picture it as Texan. Ranch fare, perhaps. And after all, it can get rather cold in Texas. Did you hear that Houston got two inches of snow last week? this definitely is something my family would like. I'm printing it right now! Steak and... I keep expecting to see the word 'kidney' next. But this is something I might actually try. In a surprising twist, my husband has been buying boneless skinless chicken breasts lately (that I have sworn off of because of expense). I think he thinks they'll be slimming. Steak and kidney pie do go nicely together, as a concept, but I don't really care for kidneys. 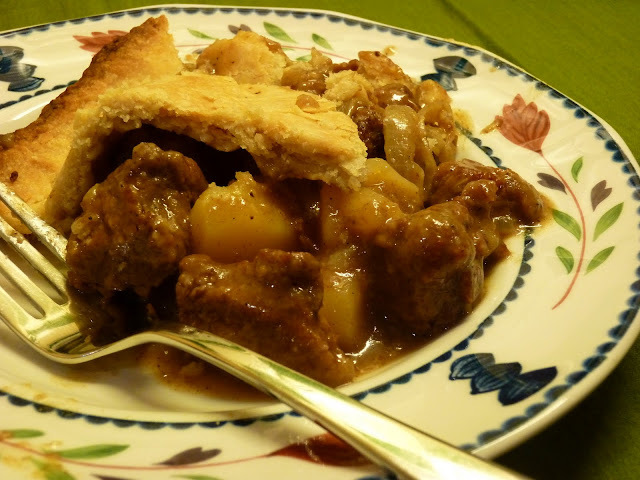 Thinking of the difference between your typical English meat pie and this recipe . . . and wine/ale comes to mind! Drink the wine on the side; really, this pie is delicious.